Submissions of Research Articles are accepted from now until 30 June 2019 . Check out the Submission Guidelines for further information on preparing your manuscript. 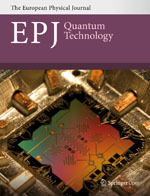 Submission Instructions: Before submission, authors should carefully read over the Instructions for Authors, which are located at http://epjquantumtechnology.springeropen.com/submission-guidelines. Prospective authors should submit an electronic copy of their complete manuscript through the SpringerOpen submission system at https://www.editorialmanager.com/epjq/default.aspx according to the submission schedule. They should choose the correct Thematic Series in the “sections” box upon submitting. In addition, they should specify the manuscript as a submission to the “Thematic Series on Space Applications of Quantum Technology” in the cover letter. All submissions will undergo initial screening by the Guest Editors for fit to the theme of the Thematic Series and prospects for successfully negotiating the review process.